The number of older people with multiple co-morbidities and cognitive impairment being admitted to hospital is increasing, and behavioural disturbances, such as confusion, agitation and delirium, are becoming commonplace. The need for nursing teams to manage the patients with such disturbances has led to the proliferation of one-to-one nursing or close observation, anecdotally known as ‘specialing’. 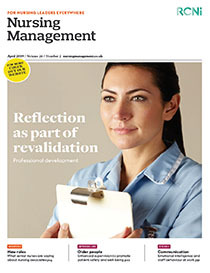 This article describes the implementation and outcomes of a new framework for providing enhanced supervision of patients in clinical wards run by the Cardiff and Vale University Health Board, one of the largest acute providers of care in Wales.